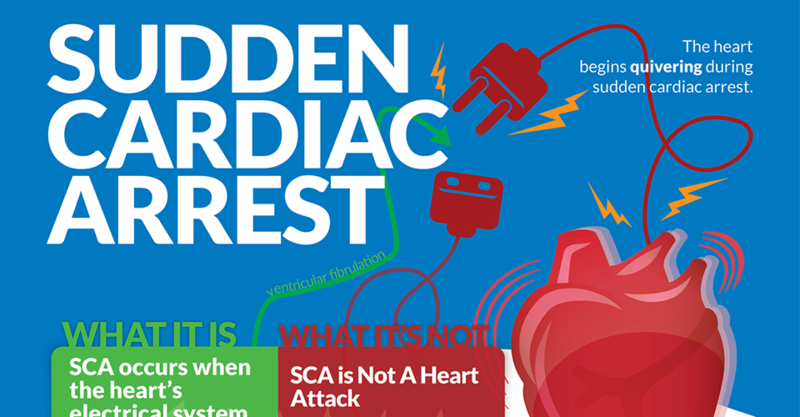 Every October, the emergency care world brings Sudden Cardiac Arrest (SCA) to center stage. SCA is a significant health threat and can occur without warning to anyone, at any time. Without early recognition and care from a bystander, the person will not survive. For all the details on SCA, check out our infographic below. Please feel free to share the infographic in your company newsletter or other employee communications, anywhere where you want to encourage bystander participation through CPR and the use of an automated external defibrillator (AED). In honor of SCA Awareness Month, we wanted to share a Good Samaritan story about a team of ASHI-trained responders who made a lifesaving difference for their boss at Kelley Trucking in Golden, CO.
Denver’s CBS affiliate CBS 4 reported on the incident that took place on June 3, 2015. When company owner John Kelley collapsed during a lunch meeting, Con Cochram, Mike Easley, Dave Seehafer, and family members Dottie, Cal, & Luke Kelley responded quickly as a team to perform all the steps of a successful save: calling 911, bringing the company AED, and beginning CPR on the unresponsive Mr. Kelley. Luke performed chest compressions. Dottie administered rescue breaths. Cal said John’s nose and lips really started turning purple. But after another shock John was back and insisting he would not go to the hospital. The Kelley’s credit the CPR training staff took in April from Nurse Nancy Waring who runs a company called Nurses to the Rescue. Thank you, ASHI instructor Waring for sharing this wonderful story about your classroom full of heroes. If you have an inspiring story of bystander assistance and would like your hero recognized with an ASHI or MEDIC First Aid Good Samaritan certificate, please click the button below and let us know! Thank you to all our emergency care instructors for everything you do to make protecting and saving lives easy.